The rains had been falling for nearly two weeks when I asked my boss to take the night off work so I could go looking for salamanders. They already know I’m strange that way. By early afternoon the rains in Marin County just north of San Francisco had stopped, but the skies were still cloudy, so I had hope. At 6:00 pm I got in my car and headed east across San Francisco Bay toward the edges of the Great Central Valley. After almost 2 hours of driving I dejectedly reached my destination—I could tell it hadn’t rained in this part of the Bay Area all day. Pacific chorus frogs, Pseudacris regilla, were calling from pools and puddles alongside the road and in the rolling hills but my quarry would not be out tonight. I walked and drove for a couple of hours before calling it a night and making the long drive back home. As I walked in my front door around midnight I thought to myself, “I really am nuts”. 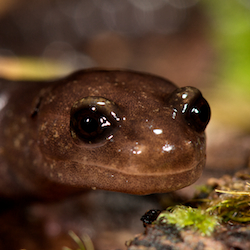 Salamanders and newts make up the amphibian Order Caudata. Newts, as known to many in the public, are just a more aquatic type of salamander and scientifically do not make up a group unto themselves. Salamanders consist of about 550 described species, with the greatest diversity of species being found in North America. 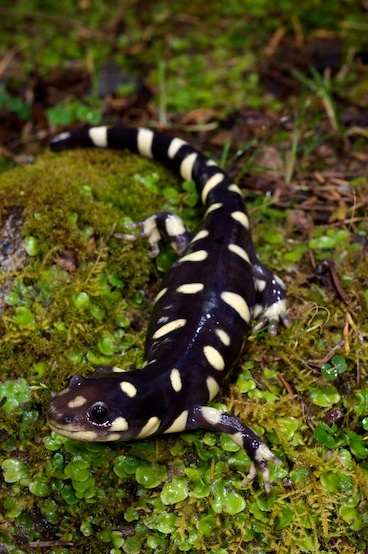 The United States and Canada contain nearly 150 species of salamanders. The eastern U.S., especially along Appalachia and the southeast, are abundantly diverse. But my home along the Pacific coast is no slouch and searching for these hidden gems allows me to get outdoors and experience nature even during the winter months, a time when most people would rather be hitting ski slopes or curling up with a good book. So the night after my failed hunting expedition I was on my weekend and the rains had resumed. In fact, they were falling heavily this mid-January day and I was looking forward to nightfall. Once again, around 6 o’clock, I headed out the door. I was in search of the California tiger salamander, Ambystoma californiense. The California tiger salamander, Ambystoma californiense, found in the rolling hills of Alameda County. The Cal tiger is a genetically and geographically distinct species from the much more common and widespread tiger salamander, A. tigrinum. A. californiense used to range over much of the Great Central Valley of California but human encroachment and habitat destruction or conversion have restricted this now protected species to a few remaining locales. The adults spend much of the year living in the burrows and tunnels of ground squirrels and pocket gophers. During winter rains they emerge at night in search of vernal pools to breed. As suburbs grow these pools are being eliminated, and as ranchers try to eradicate ground squirrels it won’t take much more to push this species to the brink of extinction. So under cover of darkness and rainy protection against desiccation, these rather large salamanders make their winter march, and I was hoping to see one. However, just a couple miles from my freeway exit, I have a touch of panic. The rains had stopped and the asphalt was nearly dry. The Bay Area micro-climates were trying to thwart me. Undaunted I made my way into the hills where a light drizzle resumed. After parking the car I walked alongside the roadway, examining ditches. As I move the chorus of frogs stops and an eerie silence takes hold. I walk for a couple hundred meters, cross the road, and begin my search on the other side. Then, there in the quiet misty night, crawling amongst the grass lit by my flashlight, was the object of years worth of desire: the California tiger salamander. I was thrilled to finally see one. Giddy and a little breathless I run to my car and grabbed my camera gear so I can photograph this amazing animal. After a brief session, I continue on my way and the salamander on his. I cruise the roads a little hoping to see more. I am told locally that one can see a dozen or more on rainy nights. Unfortunately, many get squashed by uncaring or unaware commuters in these rolling hills just beyond the suburbs. Later that night, as I walk through my front door, I think about how lucky (and not crazy) I am, succeeding in my little quest of seeing an animal few would care to see, and fewer still that would recognize its beauty. But I won’t end here. 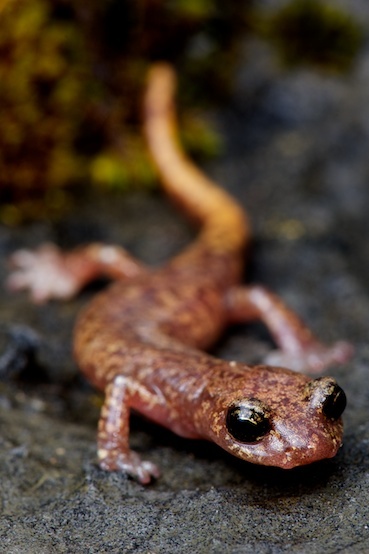 This is not a story about one salamander, but about my fondness for all of these little creatures that inhabit the cold damp places of the Pacific coast. A little more than a week after my quest for A. californiense, I decided to push my luck. In the early morning hours I drove north along I-5 and through the valley, to the south shore of Lake Shasta. There I met some friends and within an hour we were searching for the Shasta web-toed salamander, Hydromantes shastae. While at the lake I was reminded of California’s dire drought situation (the big lake was perilously low). My great state just has too many people using too few resources. How will the salamanders that have survived all these years manage? After a couple hours of searching under limestone rocks, snow still scattered on the shaded hillsides, we manage to locate nearly a dozen animals. At first glance they look a plain brown, but upon closer examination you can see the flecks and spots of metallic color in their skin. Their short stubby tails are ideally suited for pushing them up and through the rocks and crevices they inhabit. Little is known about these elusive salamanders and they can only be found within a highly restricted range. I’m happy to add a new species of amphibian to my ever-growing list. I get out and ‘herp’ regularly, but mostly as a generalist—I travel to favorite locations and happen to see what reptiles and amphibians I can turn up. But many species, like the two just mentioned, have very limited ranges and are rare and threatened. After these two excursions, I couldn’t help but wonder what would it be like to make dedicated runs, sometimes to the far reaches of this big state, in search of specific salamanders. Could I keep this up? The genus Hydromantes consists of ten species, three of which are found in the U.S. and restricted to small ranges in California. The most rare of the three is Hydromantes brunus, the limestone salamander. This animal is restricted to a narrow stretch of the Merced River canyon just below Yosemite National Park. With some locality info I headed off on my next weekend to the western foothills of the Sierra mountain range. I had another drizzly day and it took me four hours to reach my destination. For a couple hours I drove along the road looking for suitable habitat, parking at turnouts and scrambling up cuts in the hills, carefully looking under logs and boulders around talus slopes. I don’t turn up my prize but I do locate a couple California newts, Taricha torosa sierrae, and another species new to me, the Hell Hollow slender salamander, Batrachoseps diabolicus. The slender salamanders are a tough group. Recent taxonomic work has identified somewhere around 20 different species, almost all of which look like little brown worms with tiny, nondescript legs.